While some may dismiss Dr. Frieden’s comments as partisan against the Trump Administration, could the US be affected by diseases that originate in other countries? That is normally the case with the flu, to cite one example, every year. Could it be much worse than what we have seen over the past several decades? I recently watched the movie Contagion. It presented a somewhat scientifically-based scenario of what could happen with a deadly-enough pathogen. In the movie, many millions died around the world. Yes, that was only a movie. Yet, humankind really is at risk. And modern travel and other practices are placing humanity at even greater risk, as are genetically-modified foods (cf. Pestilence Issues and Genetically-Modified Corn). 8 … there will be famines and troubles. These are the beginnings of sorrows (Mark 13:5-8). 11 And there will be great earthquakes in various places, and famines and pestilences (Luke 21:11). According to Jesus, one or more significant pestilences will begin shortly before the start of the Great Tribulation. Biblically, it appears to be highly likely that the USA and its Anglo-allies will be hit hard by pestilences just prior to being taken over (Leviticus 26:21-25) by the Beast power (Daniel 11:39). The above ride begins PRIOR to the start of the Great Tribulation. A fourth of the earth–that is something in the neighborhood of 2,000,000,000 people, a huge amount – will be killed. 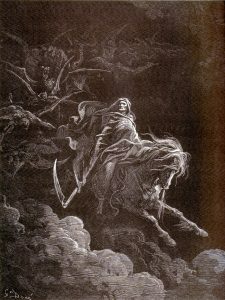 The ride of the pale horseman of death will result in deaths from war, famine, and pestilence. While no pestilence will stop the rise of the Babylonian Beast power, the Book of Revelation indicates that the final effect of the fourth horseman will ultimately affect this spiritual city of Babylon, and apparently result in death (Revelation 18:8) and including by the sword (Revelation 19:14-21). Tougher times are coming. And for some parts of the world those tougher times may be here now. People who can prepare, should. Both spiritually and physically. The former CDC Director is specifically warning to watch out for something that Jesus said would happen. This entry was posted on Monday, February 5th, 2018 at 7:30 am	and is filed under Prophecy. Infection-gate: A dangerous scandal hitting the USA?